A recently approved headquarters hotel will connect to the upgraded convention center, making the city feasible for more medical and pharma groups. The past year brought good news to greater Miami's hospitality industry, and to meeting groups interested in using the Miami Beach Convention Center. In September, the city unveiled a redesigned and expanded MBCC, featuring a new 60,000-square-foot ballroom to go with 84 breakout rooms and exhibit space that now totals 500,000 square feet. What's more, a new six-acre public park opened adjacent to the center that can serve as an overflow exhibit area or as a reception site. The Miami Beach Convention Center's new lobby. 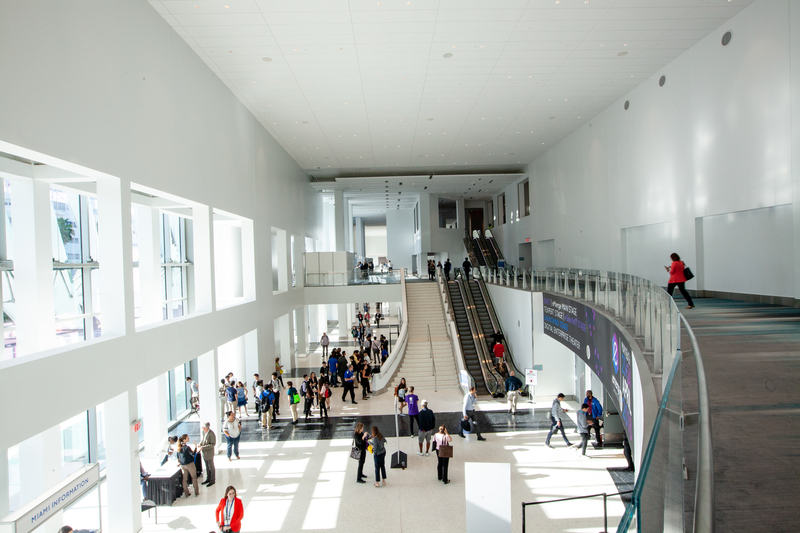 Interestingly, the first citywide group to use the convention center's four expanded halls was the American Health Information Management Association. Less than a month later, the International Society of Aesthetic Plastic Surgeons took over the venue. Combined, the two shows generated more than $10 million in economic impact for the city, according to the Greater Miami Convention & Visitors Bureau. "We were fortunate to have early adopters like AHIMA who believed in the destination and booked the GMCC without a headquarters hotel," says William Talbert, president and CEO of GMCVB. "We know that they and other groups like them would not book again without a connected convention hotel in place." In November, that major sticking point was remedied when residents voted to approve plans for a privately financed 800-room hotel that will be located at the corner of 17th Street and Convention Center Drive, and connect to the convention center. When the property opens (likely to be in Q4 2022), it will be the final piece of a convention center district that also features the Fillmore Miami Beach at Jackie Gleason Theater, a historic Art Deco building for live entertainment or presentations; New World Symphony and Soundscape Park, a Frank Gehry–designed concert hall with 756 seats; Carl Fisher Clubhouse, an historic landmark offering 5,000 square feet of event space and its own kitchen; and Botanical Garden, a 2.6-acre urban oasis that can also serve as dedicated event space. Lincoln Road, a shopping, dining, and gallery district, is walking distance from the center, while Atlantic Ocean beaches are just two blocks to the east. The Miami Beach Golf Club, open to public play, is less than one mile away. GMCVB's Talbert notes that the medical and pharmaceutical events market will be critical to the success of the expanded convention center and new hotel. "Those groups can afford our hotel product," he told MeetingsNet in early January. As a result, "we have a partnership with Baptist Health South Florida to try to bring a lot more medical meetings here." With 7,500 hotel rooms in Miami Beach and another 6,800 in downtown Miami, six miles away, greater Miami is capable of handling most citywide medical events. Lastly, Talbert cites one more selling point, particularly for shows that have many international attendees: Miami International Airport serves 109 airlines, the most of any airport in North America.